Pimelea ferruginea is one of a number of plants commonly known as the Rice Flower. Native to Western Australia and very popular in gardens across the country. 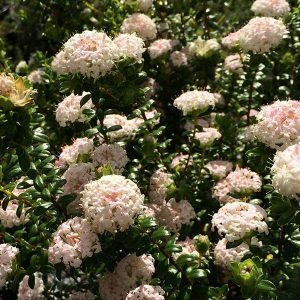 This is bushy low growing shrub, flower are generally pink however pale pink to white forms, and deeper pink forms are also available. Flowering from spring to early summer, Pimelea ferruginea will reach around 1 metre in height, and over time spread to twice this. The foliage is evergreen and an attractive glossy green in colour, and the plant will naturally form a rounded clump with a little tip pruning each year to keep it in shape. The small individual flowers appear in tight clusters on terminal spikes. Very popular with the cut flower industry. A little more forgiving than some native plants, this is a species that will grow well in containers, and also copes with a wider range of climates than some. Use it in the garden border as a feature plant, or perhaps as a low growing edging plant. P. ferruginea ‘Magenta Mist’ – Deeper coloured flowers than the species. P. ferruginea ‘Bonne petite’ – Slightly smaller than the species with similar yet smaller and paler coloured flowers to the above. P. ferruginea ‘Blush Solitaire’ – Paler flowers with a pink blush. P. ferruginea ‘Pink Solitaire’ – Bright pale pink flowers. 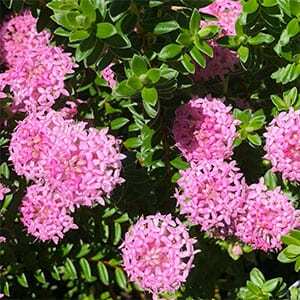 A well drained soil is essential, in fact Pimelea ferruginea will grow well in sandy coastal soils. This is a plant that requires very little fertiliser, a little native plant fertiliser once a year is adequate. The best time to prune is immediately after flowering. Light tip pruning to maintain shape and increase flowering is recommended. Simply prune back the spent flower heads and avoid cutting back into bare wood. Propagation is generally from cuttings of new growth. It is possible to propagate from seed, however this is difficult with poor germination rates. Poor drainage can cause root problems and dieback. Cutting back into old wood will cause dieback. Lack of sun will inhibit flowering and growth.